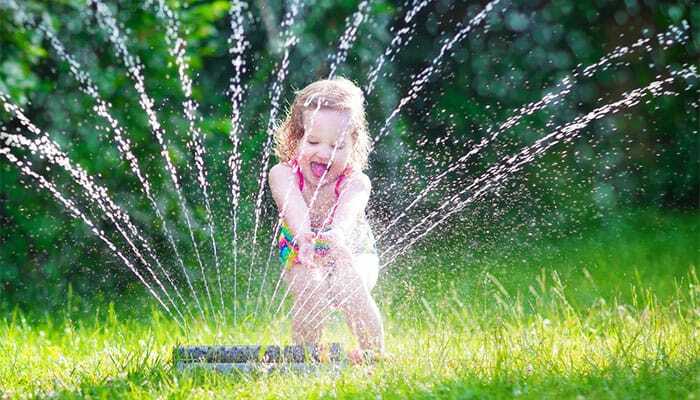 Kids and lawns go together perfectly on long summer days with the dog chasing them around the sprinklers. Until the dog starts digging too far and the kids start pulling up the grass and throwing it in tufts. Then, it can get a little tense. Having a lawn that is built to withstand tougher wear from active kids or pets is a great way to make your life a bit easier. These are a few turfs that work great for parents who don’t want to cringe every time they see their children running around outside. Having a dense root system is what helps grass recover quickly from being stomped on or ripped up. Varieties like the medium textured Conquest Couch are perfect for this. Couch varieties are also famous for having a softer touch, meaning kids or pets with sensitive feet will have an easier time than with scratchy grasses. Maintaining a lawn can mean trimming and watering anywhere between every day to every fortnight. Finding a variety that uses less water and grows slower means you’ll have less maintenance to do. And when you add extra wear and tear from kids, you don’t need to create any extra maintenance work if you can help it. A great variety that’s very low maintenance is the Palmetto Buffalo which requires 11.2% less mowing than other buffalo varieties. With its long roots, it keeps well even in drought and requires less water, making it perfect for hotter areas in Australia. It’s also known for its brilliant colour that lasts all year in most areas. Thatch is the dead and living organic material between the soil surface and green vegetation. It is made up of roots, stems, shoots, and other organic debris that takes longer to break down than it is produced. Although thatch is an important element in grass, having too much means a harder lawn to care for. Buffalo grasses like the Sapphire Buffalo have a lower level of thatch, meaning they’re less spongy and less susceptible to disease-ridden pests growing in it. Having about 1.25cm of thatch provides a useful insulation layer and resilience for physical activities or sport — however, more than that can end up making the grass harder to manage. Far more important than caring for our lawns is caring for the health of our children and pets. Keeping turf as free from pests and diseases is a great way to do this. One great variety is the Empire Zoysia which is not only resistant to pests like grubs or weeds, it also has very low watering and mowing needs compared to similar varieties. Though having pests in your lawn won’t necessarily harm your kids, keeping them away by maintaining a healthy lawn will take the guessing game out. Hi Quality Turf is a leading supplier in Sydney and Wollongong. Come to our store to feel and test any of our 10 varieties of residential lawn turf.